Betsy Carlson is from Grand Rapids, Michigan and travels across the country representing BERNINA as a member of the Event Team, Product and Sales Training Team and the Q Series Team to sell BERNINA quilting machines at quilt/sewing shows. Betsy’s love affair with BERNINA began as a teenager, pining over BERNINA machines at the fabric store. The Free Hand System caught her eye, reminding her of the machines she used working in an alterations department. Finally, she bought a BERNINA 1130, and created Nine Patch Sewing Co., performing alterations and creating custom window treatments, custom clothing and slip covers, while making clothing for her children. When Betsy learned to quilt, she was hand piecing and quilting, then transitioned to using her machine for both tasks. 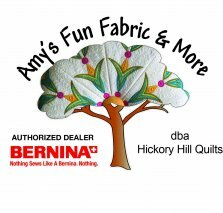 BERNINA became part of Betsy’s career when she joined a dealer as the mastery, embroidery and software instructor. Joining the Event Team created an opportunity to share her love of BERNINA. When Betsy has an opportunity to sew for herself, she is creating art quilts, inspired by yearly retreats with Nancy Crow at the Crow Barn. 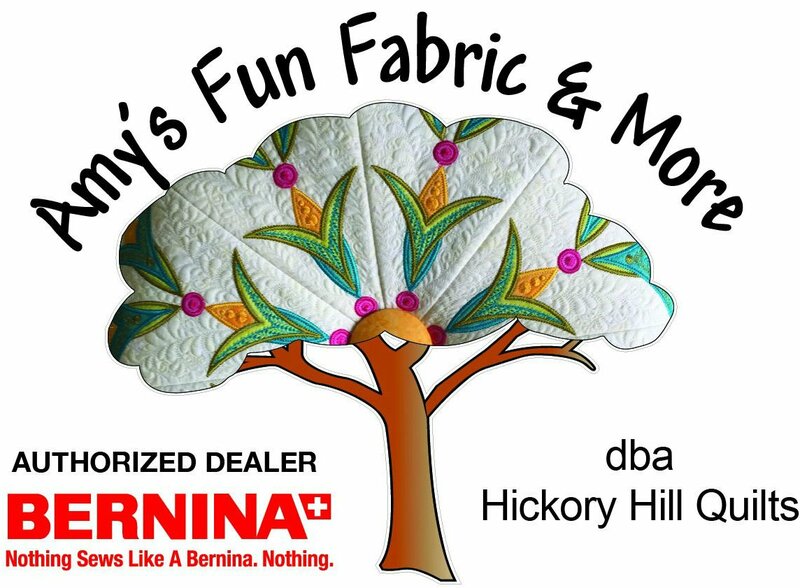 Betsy will be leading the BERNINA ACADEMY sessions at Hickory Hill Quilts (June 21 & 22). The kits are designed to take attendees through a wide variety of mediums on which to sew dispelling any fear of fabric while experiencing the capability of the BERNINA machines. The machines are new shipped in by Bernina for this training. There will be two attendees per machine. The machines will be discounted after the event. Should attendees decide to purchase, their $200 for the class will be applied to the purchase of the machine. Sign ups are on the web sights and several seats are already taken! JUDY NIEMEYER/QUILTWORX 2018 TRAINING SCHEDULE! Judy Bowers and I have finally had time to complete the Hickory Hill Quilts training schedule for 2018. Please see below. They are on line and ready for sign ups. Bring unfinished Quiltworx projects for Judy Bowers to help get you jump started to get them finished. Individualized instruction and sewing support. This course is two days and loads of fun! We have designed two sew days in support of this project to help you get finished! One between the two training sessions and one just after giving attendees time to finish this fun and easy project. This is the gorgeous round natural table topper on the front of the web page. She is also doing it in the square format in Christmas colors – either shape can be chosen from the same pattern set. The 10/24 Sew Day is designed in support of this class to give attendees additional instruction if needed. This will create gorgeous new table centerpiece for the holidays if you choose Christmas fabric. We finally have our first art class on the schedule. We got permission from Diane Taylor, Creator of Ficklesticks, to teach her fabric jewelry making techniques. Bonnie Kastler will be instructing. Should the class sign up reach more than 10, we will separate the class so that everyone has plenty of room to work and enjoy the projects. She will be demonstrating how to use the tool kit included in the class fee and how to make one of her favorite necklaces (picture on line with class). Sign up and come have some fun!